In an earlier post I wrote about one of the mysteries of dark matter. While dark matter matches most observations very well, it doesn’t do well in the area of dwarf galaxies. In particular, computer simulations predict that there should be many more dwarf galaxies than we observe. This has been taken to mean that either the simulations are somehow flawed, or dark matter isn’t the complete solution we’ve thought. But now new research has found that dark matter simulations might be right after all. 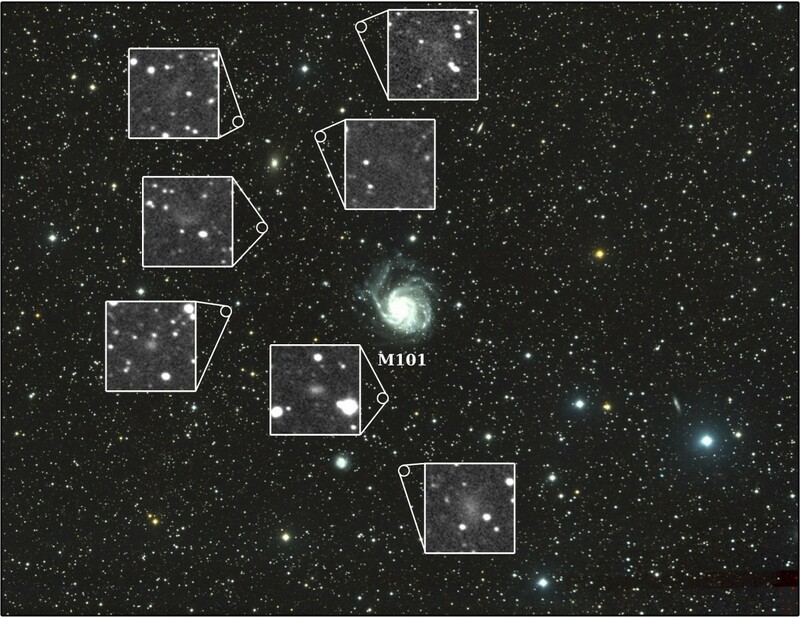 The paper has been published in the Astrophysical Journal, and presents the discovery of seven dim dwarf galaxies near the Pinwheel galaxy (also known as M101). Normally this wouldn’t be that big of a deal, but what makes it impressive is how they were discovered. The team used a new tool at Keck observatory known as the Deep Extragalactic Imaging Multi-Object Spectrograph (DEIMOS). It is able to observe a patch of sky and measure the distance and radial motion of the stars in its field of view. When the team looked at the results, they found that some stars were clustered not only by distance, but also by motion. In other words, they were in the same region of space and moving in the same way. This means the clusters are gravitationally bound as a group. The number of stars in these groups is sufficient to consider them dwarf galaxies. These dwarf galaxies are so dim that they wouldn’t be noticed by the usual methods. These were found in a single region of sky. If other regions of sky have similar dwarf galaxies, then this could explain the dark matter mystery. It could turn out that there are lots of dwarf galaxies just as dark matter predicts. They are just dim galaxies, so we haven’t noticed them until now.